Xyron and Quick Quotes Blog Hop! What a fun week it's been, hopping with our friends at Xyron! 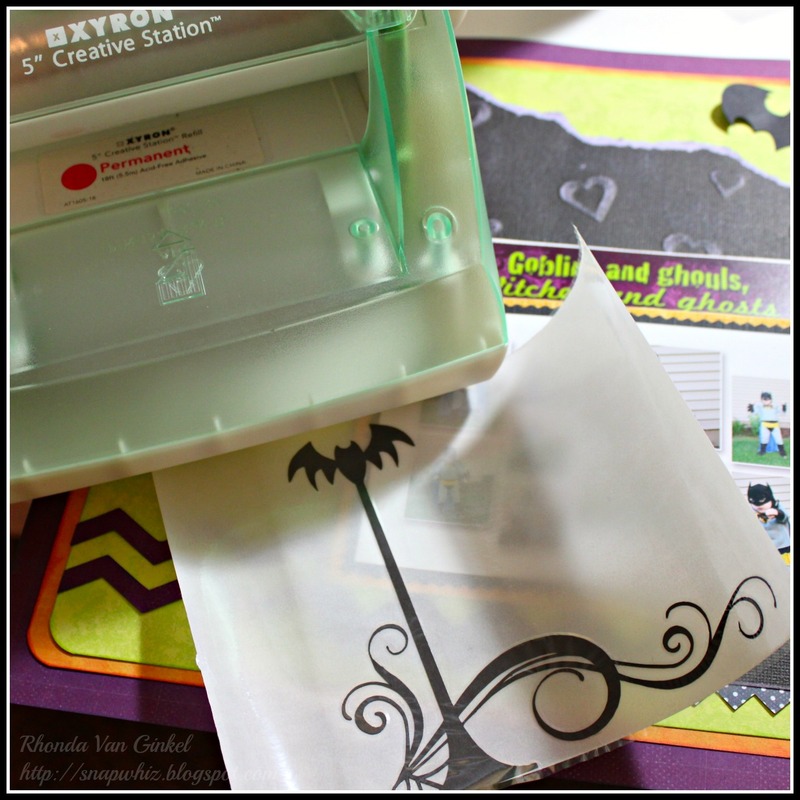 Today we have Rhonda and Christine sharing some fun projects featuring the all new "Halloween" collection by Quick Quotes and our favorite Xyron adhesive!!! Be sure to leave a comment for your chance to win a prize*! Happy Friday to you! Rhonda here today with you. I'm so thrilled that Quick Quotes and Xyron have teamed up this week to share products and creations! Haven't the projects been fantastic? I'm in absolute LOVE with the new Halloween collection from Quick Quotes! Just check out these vibrant colors... *swoon*! I embossed a 12x12 piece of Core'dinations with hearts. the Xyron 5" Creative Station. A close up for details. I don't know about you, but I use my Xyron X machine and my 5" Creative Station all the time. It's particularly wonderful for all of your intricate die cut shapes and chipboard pieces. If you haven't seen the Xyron Creatopia machine in action, you are missing out! 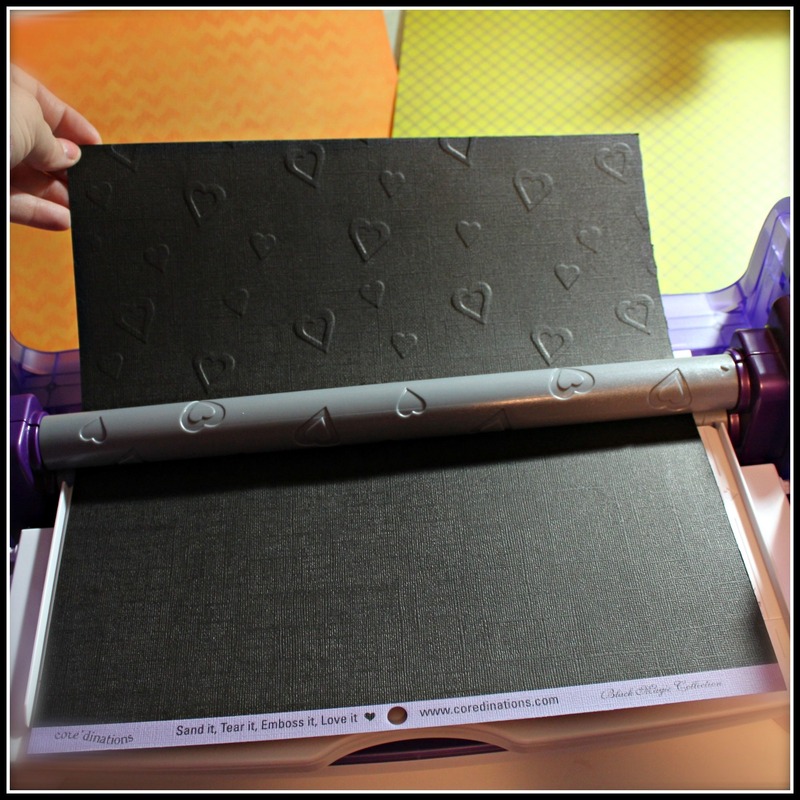 It does so many cool things from cutting, embossing full 12x12 pages, applies laminate and adhesive. You can see even more information on all of their products at www.xyron.com. Hi Quick Quotes and Xyron fans, Christine here! 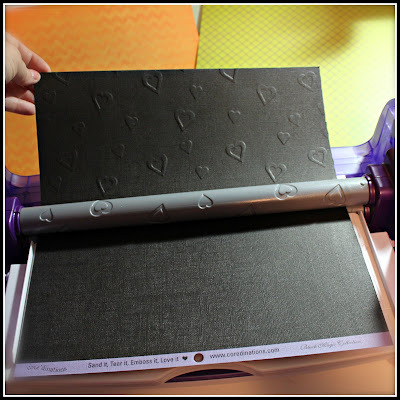 I used the Xyron Mega Glue Runner and the 2.5" Create a Sticker Maker for my adhesives on this page. The Glue Runner worked awesome for getting all the little pieces down for my spider web. I also used it for my little chipboard spider and title! That spider web was so fun to create, cutting up pieces of patterned papers to fit each part of the web was challenging but worth it for the look. I'm glad I had good adhesive to speed the process up! I turned my banners into stickers using the Create a Sticker Maker and ensuring that they would stay down well. Thanks to Xyron for being a leader in the industry and creating such great adhesive. And thanks to Quick Quotes for a super fun Halloween line! plus a grab bag of Quick Quotes goodies! One comment per person, per day please. All winners will be announced on Sunday 9/2. p.s. They have prizes too! Really clever LOs! love Halloween. Now I am almost fully convinced I need a Creatopia! The scrapbook layouts are wonderful and the photos are so cute. I love the cute Boo layout. I'm gonna have to look at what all the creatopia does. i love the 'be afraid' very much. if it's alright, i'd love to 'lift' this for the cover for an altered composition book. thank you for the chance to win. this is awesome! Love these Halloween projects! The colors are such fun! I love the embossing you did with the creatopia. I will have to look at this product! I am loving these layouts, they are both adorable. And seeing the Creatopia in action on the first layout...this machine is going on my wish list. What great pages! 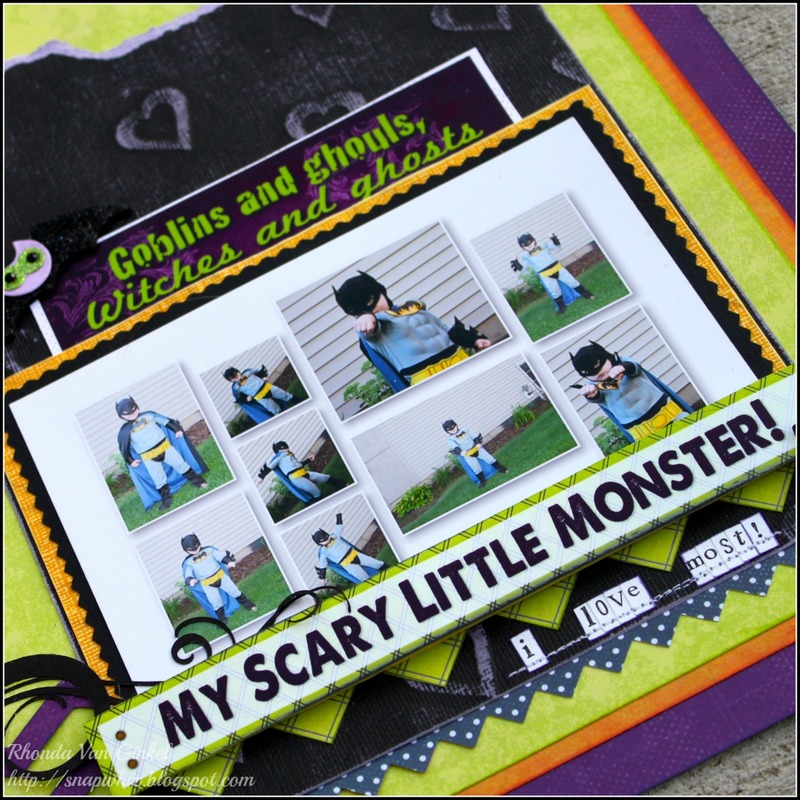 Halloween is such a fun time to scrap and obviously Xyron and Quick Quotes can make the creative process even easier! Love all the details with "batman" and the background detail on the spider web. Very clever! What an awesome projects. love the spooky theme love the layering and the bats are super goolish. thanks for sharing and for the chance to win. Super cute layouts :) - I'd love to win that prize!! I am loving the Halloween projects. Halloween is my favorite time of the year. So much fun! Thanks for sharing these great projects and for giving us a chance to win some awesome prizes! I watched a Creatopia video yesterday and I so want one. I love the heart embossed paper, too cute!! I love the use of purple and all of the embellishments in these layouts. Great projects and ideas! Love giveaways of Xyron products! Always useful! Thanks! The halloween line has beautuful colirs. I am digging this Halloween collection. Time to get out some candy and start making some Halloween decorations! Great LO's ...thanks for sharing and a chance to win. Every year a do a mini book about my nephews and their halloween costumes. I want to get some of this paper for this year's book. Now I definitely can't wait to start the halloween experience with crafting and decorating. Thanks for the opportunity to win fabulous prizes. Love that the Creatopia allows you to emboss full 12 x 12 sheets! Very fun layout! Love both projects, they are so cute. Halloween is my favorite holiday. I can't wait to make this years Halloween cads. I'm saving up for the Creatopia machine. Love my investments to be multifuctional and this machine fits the bill! 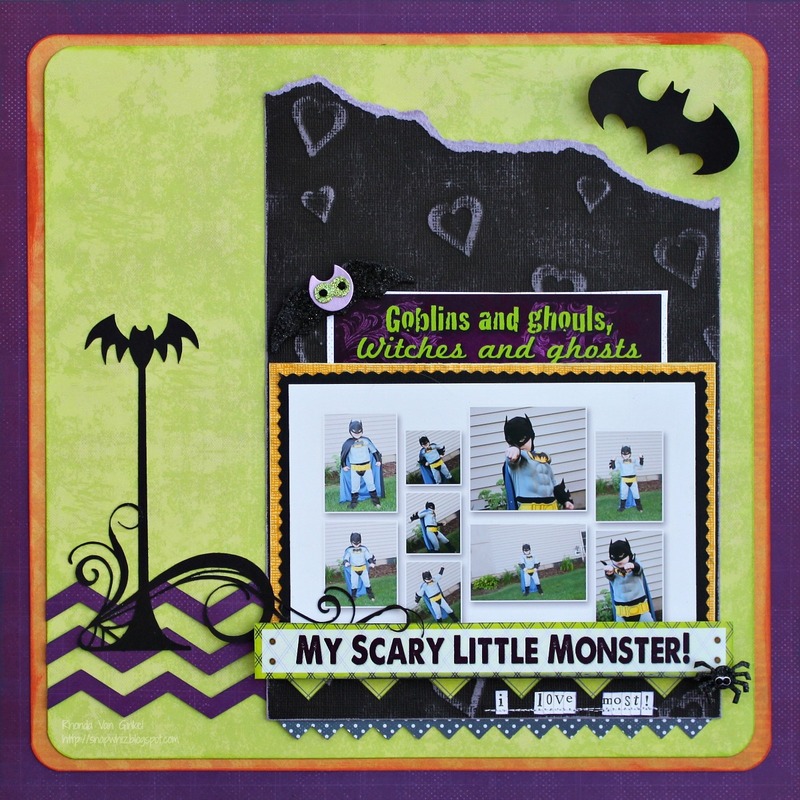 Love the Halloween layouts-I am loving this paper collection! So cute. And, love the ideas i'm getting from these. Great Halloween layouts! I had never seen the Creatopia machine before this site. Thanks for showing me something new! Love all the Halloween projects this week. Cute projects. That was the first time I saw the creatopia used,cool! Great projects! New follower....can't wait to see more. Had fun this week and am inspired to do some pages over try long weekend. Thank you! Love the layouts and love my mega tape runner! the black core'dinations paper works so well with the Halloween projects. Loved your multi-colored web. Great projects. awesome projects! thanks so much for the chance to win! love the inspiration! definitely lifting those! Love the ideas!! thank you for sharing your creativity! Oh Christine! What an adorable little monster. Thank you so much for sharing your layout and your lil monster! I love that spider web! I didn't realize the Creatopia could emboss on 12 x 12. I better look into that! a grab bag of Quick Quotes goodies and a Xyron Mega runner are two great prizes. The layouts are cute and colorful. The Lay outs are awesome!! Love the web! Think the Creatopia needs to go on my Wish List!!! Thank you as!! I love the "be afraid, be very afraid" project. Xyron is an awesome project. Thanks for the chance to win. I love how the purple zig zag blends to the black zig zag under batman! I also think I might need a Creatopia, but I want to attend a class to try one out if possible. Love the projects. I am already a follower and my name is Shari Klyn. Again, what cute layouts. I love the spider web. I never heard of the creatopia before, now I have to check it out. Thanks for a great week of Halloween samples. Both scary monsters are so cute! Love the layouts! I'm loving this go to each day so thanks to both of my favorite companies for inspiring us! I do love the pictures. Very clever LO's! Love it! Very,very cute layouts! Great inspirations and ideas I'll be sure to try! Thanks for the chance to win these super great products! These are both very cute layouts! Thanks for giving me ideas for the Creatopia! Love that embossing and then sanding! 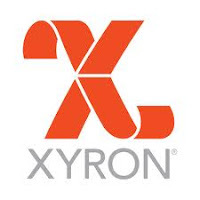 Thanks for partnering with Xyron this week. It's been fun and I've taken away so many new ideas! Anjie Simmons ere. Love this layout. I am already a follower. Thanks for a chance at these great products. Love the layouts. Thanks for the chance to win. Love the Halloween L/O's esp the colors and the web on Christine's L/O. First time seeing the Creatopia and want to see more of this tool and what it can do. Love your Halloween layouts. That is one of my favorite holidays. Love the layouts will have to try!! I'm a follower. I wish I had a Xyron Creatopia!! Great layout.